It rained and rained and rained, but I had a great weekend at Braidwood. It was lovely to get out into the wide open countryside and to meet lots of friendly quilters. 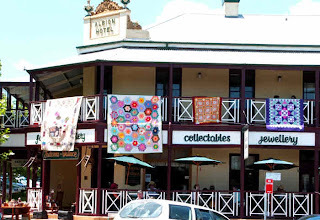 I was looking forward to the Airing of the Quilts and seeing hundreds of quilts hanging from the historic buildings, but obviously that got cancelled because of the rain. I guess no-one wanted to see the Washing of the Quilts. LOL. I'm thrilled to say my pre-cut fabric hexagons were a big hit. It makes me so happy to know that I am saving people lots of time and effort. And I think quite a few people will be getting my handmade pendants in their Christmas stockings this year. My Mum was a fantastic co-stallholder and a wonderful B-and-B host too. Thanks so much Mum! The weekend could not have gone smoother. I'm looking forward to returning next year, and I'll make sure I allow some time to see the exhibitions. P.S. There's a small problem with my website - I can't seem to update any information e.g. product availability. (I think this happens due to automatic security upgrades. I haven't figured out how to fix it yet.) 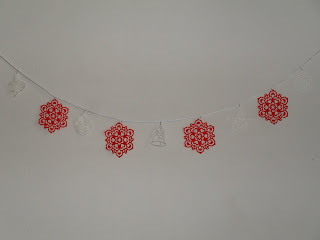 If you want to order any fabric hexagons, can you send me a quick email at joanne@pbpatch.com.au to check they are available first. 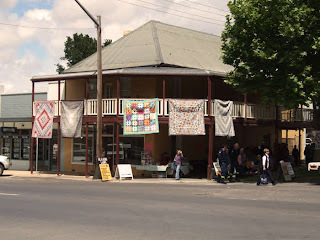 I'm looking forward to going to the Airing of the Quilts at Braidwood NSW this weekend. I've been meaning to go for years. I hope the rain clears up! 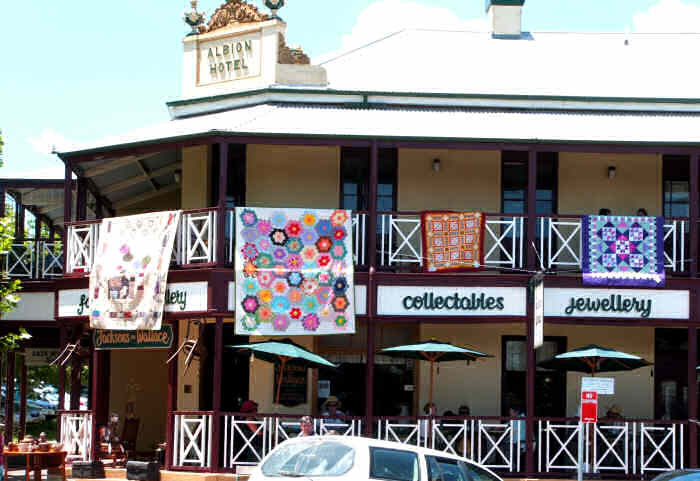 The Airing of the Quilts started in 1995 with a display of just 25 quilts, and now it has around 500 displayed inside and outside all over this heritage-listed town. 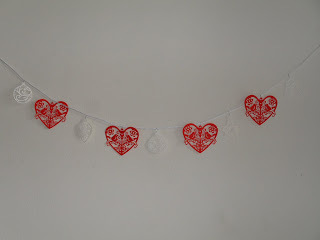 I might be breaking copyright by showing this photo from the Braidwood Quilters website so I'll stick to just one photo. Click here for heaps more great images of their past events. I just know I'm going to fall in love with this place - the absolute opposite of the day-to-day demands of working in Sydney. I'll be staying at my Mum's in Goulburn (thanks Mum!) and we'll be driving down on Saturday morning to set up a market stall. 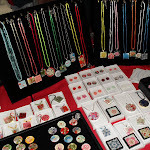 I hope it's a sunny Saturday for the Braidwood Markets because I've been clearing out my cupboards and have got boxes full of my handmade pendants and rings (made from Japanese paper), badges and brooches (made from vintage kimonos and saris) and other stuff to sell (all at special market prices). 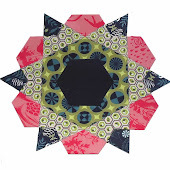 I have also been busy die-cutting more packs of fabric hexagons and paper and card templates. - a collection of vintage wedding gowns. There are many other craft things going on at Braidwood this weekend, not just quilting, and you can read all about them here. I'd love to hear if you're planning on going, or if you've been before. Feel free to comment and tell us all about it. Maybe I'll even see you there! A funny anecdote? A structured well-written storyline? Great photos? I'm sure I'm not the first person to fall into the trap of wanting to do all these things well, then finding that their blogging has slowed down as a result. To be honest, I didn't really intend to start blogging, although it had crossed my mind a few times. But on the spur of the moment I thought I'd give it a go, share a few of my crafty creations, and maybe get in touch with some crafters out there in the big wide world. And what I've learnt is, a good blog is all about sponteneity, openness, generosity of spirit, and humanness. And real life. I went to a seminar on the weekend about living with Aspergers Syndrome. I figured out about two years ago that I have it, but I haven't really come to terms with it yet. I realised on the weekend that I've been telling myself "I'm only a little bit Aspergers, so if I make an effort, I will grow out of it". It doesn't really work like that, does it. There's really no such thing as just a little bit Aspergers. It's time for some self-acceptance don't you think? Time to accept the fact that I think differently than most people, I feel differently, I even see, hear and smell things differently. I process information differently, I make sense of the world differently ... and I have my own unique contribution to make to the world. So maybe you'll hear a bit more about AS on this blog. And you are welcome to email me if you need to talk about it. I apologise in advance if I inadvertently over-share. Just ignore it and come back for the next post, because I guarantee you that this blog will stay 95% about craft. OK, maybe 90% about craft and 10% about me. I'm definitely not dropping below 85% craft LOL. Well here's what I made last week from some used manila folders that were thrown away at work. 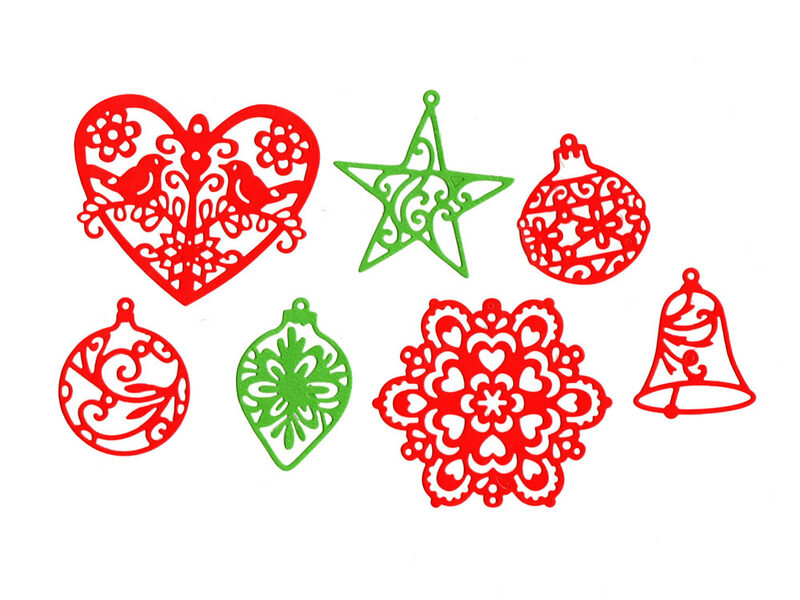 Die-cut Christmas decorations! I made heaps and heaps in a quite a few diffferent colours, but I really love the folk-art simplicity of these red-and-white garlands. 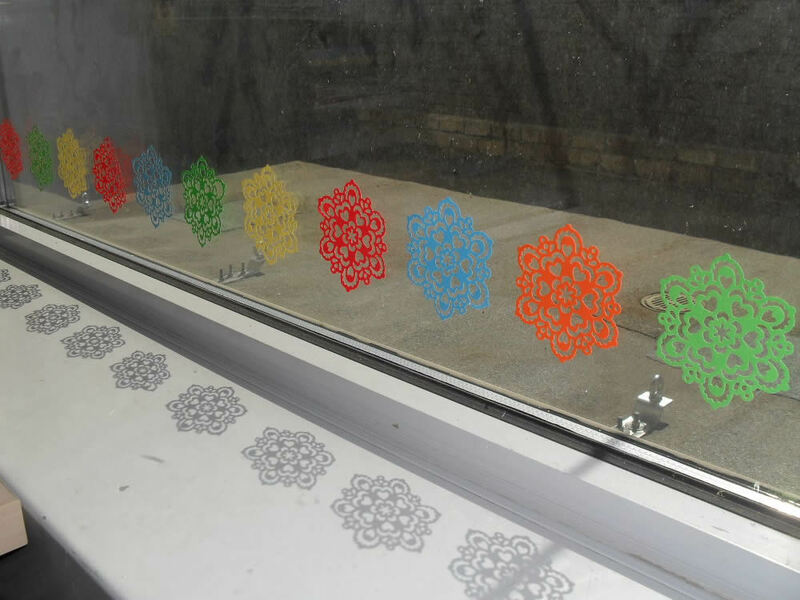 The loose die-cuts are a big hit with my colleagues. The pot plants are getting baubled (paper clips do the trick) and the windows are getting snowflaked. 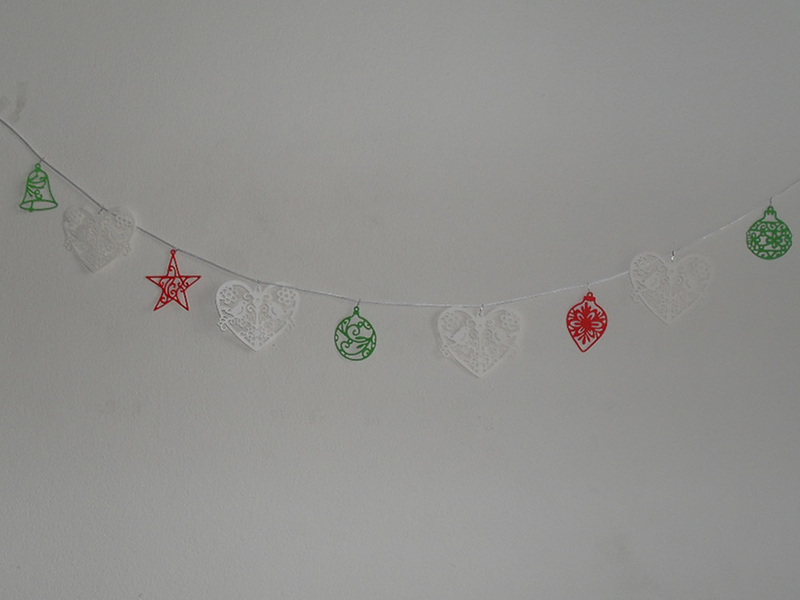 Makes a welcome change from the tatty tinsel that we usually drag out each year. Here's the window next to my desk. (The dust is on the outside not the inside!) A nice contrast with the brick wall behind the window LOL! That's all from me for tonight. It's way past my bedtime! I've had a yummy yummy birthday. Out to lunch at a favourite cafe on the bay (crispy-skinned barramundi drizzled with chilli oil - yummmm), phone calls from my family and friends, and a sweet sweet e-card from a lovely online friend. 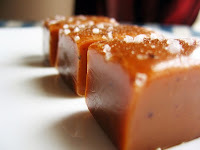 I have also ordered my favourite favourite favourite ones - French Sea Salt caramels and French Sea Salt & Lavender caramels. Hi, I'm back. Before I announce the winners selected by Random.org, I want to say a big Merci Beaucoup to everyone who participated. I have really enjoyed learning all the new words (parapluie and portmanteau = umbrella and bag, thanks Manda and Gemma) and new sayings (Journée ensoleillée = a day with sunshine sounds good. Thanks Anette J, that's beautiful). I've also enjoyed being reminded of some great memories, like seeing Les Miserables on stage, and learning to play Debussy on the piano. The winner of the pack of pre-cut fabric hexagons is Gill from the UK. (Sacre bleu!) 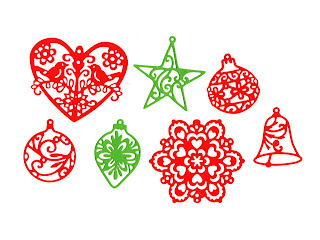 Gill, you can choose from the Rounneries Deux pack or the Fa la la la la pack, or any other pack from here. Lindi from the Hunter Valley, Australia, has won the Paris Flea Market fat quarters and Sue from Elderslie, Australia, has won a handmade pendant. I will contact you all to find out your choices. I'm getting hungry now so I'm going to say goodbye now and go and have my chocolate cake. Thanks again to everyone for participating. It has been a lot of fun.